Food can shape a destination’s culture, so I always feel like it is nice to try the local specialties when I travel. I had been to a few Portuguese restaurants, but I knew there was so much I had not tried. In Portugal and Porto more specifically, food plays a big part in everyday life. It is not uncommon for a dinner to last hours because it is an event. Our first dinner in Porto lasted from 8 pm until almost 1 am! I wanted to experience more of the local food culture so we decided to try a Porto Food Tour. Walking to our next stop – Porto is such a pretty city to explore. The Porto food tour we took was the Finger Food Tour with Porto Walkers. According to the website, we would have eight snacks and three drinks. The tour runs from 11:30 am to 2 pm and they suggest you come hungry. We were also warned that we would be going to very local spots and might run into some rowdy locals. I was excited to try some new dishes and see more of the city. We met our guide at 11:30 am, GB, outside the Mercado Do Bolhao, the iconic food market in Porto. It’s always great when you can have a local show you around, it’s the best way to learn interesting facts about Portugal. He was easy to spot in his red shirt. Two lovely ladies from Switzerland would also be joining us on the food tour. We all hit it off right away and I could tell it was going to be a fun time. 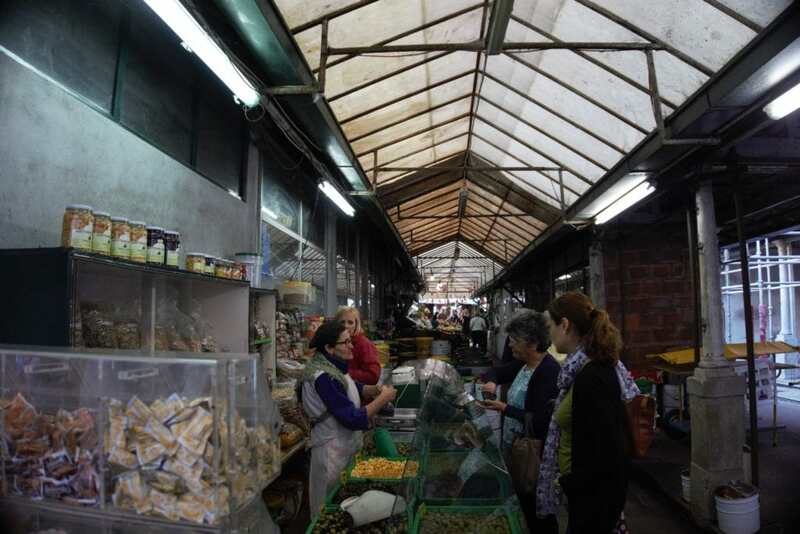 To start our food tour in Porto, GB walked us through the market. I always love going to local markets when I travel (Riga Central Market or La Boqueria in Barcelona for example) and it was even better having a local guide. GB walked us down the aisles and pointed out some of the interesting stalls. One that caught my attention had chickens in one cage and pigeons in another. It’s more like something I would expect to see in Asia than at a market in Porto. We stopped at another stall and GB got us some snacks: olives and Lupin beans. The olives were milder than kalamata olives and to me tasted similar to the black ones we put on nachos. I had not tried Lupin beans before but they reminded me of edamame. You are supposed to take off the outer shell and then you can just eat the bean like a snack. I was excited to find a tasty new healthy snack. If you want to try them, you can find the Lupin beans on Amazon here. Our next stop was to try salted dried cod. Since the cod eaten in Portugal comes from Scandinavia, it is typically dried. We went upstairs and GB brought us some vegetable soups, fried cod sandwiches, and a bottle of Vinho Verde (my favorite Portuguese wine). I had cod several times already in Portugal and didn’t even realize it was dried because it was still moist and flavorful. 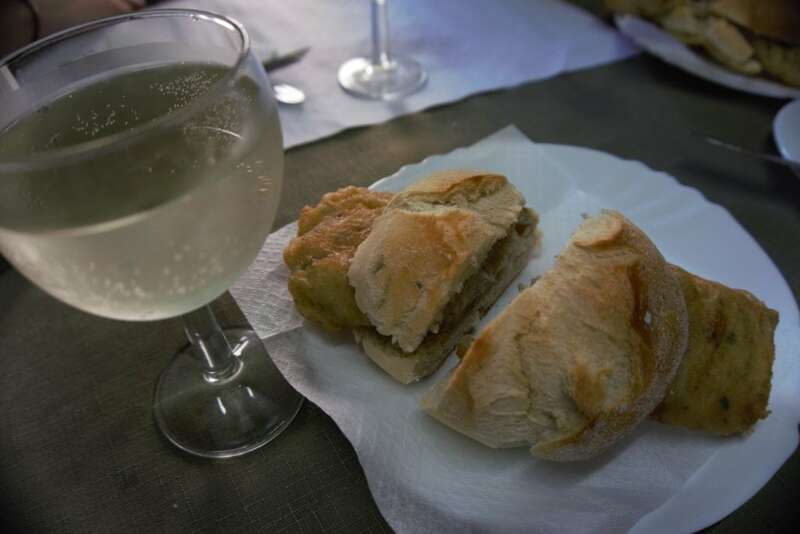 The salted cod sandwich with a glass (or two) of Vinho Verde. Next up on our Porto food and wine tasting tour, we tried what I would describe as something similar to an empanada. I love empanadas and enjoyed this one too. The Portuguese know how to make pastries. We had a beef one, but they also had a vegetarian version. Then we went to another small local place to try the ham and brown bread. As you can imagine the ham was delicious. The brown bread tasted different yet familiar. I asked GB about it and he told me that it had cornmeal in it. Then I realized it tasted like cornbread, which went well with the ham. We also had a pitcher of Vinho Verde which we drank out of ceramic cups. That felt a little weird, but the wine still tasted great! Olives, ham, and the brown corn bread with more Vinho Verde served in ceramic cups. 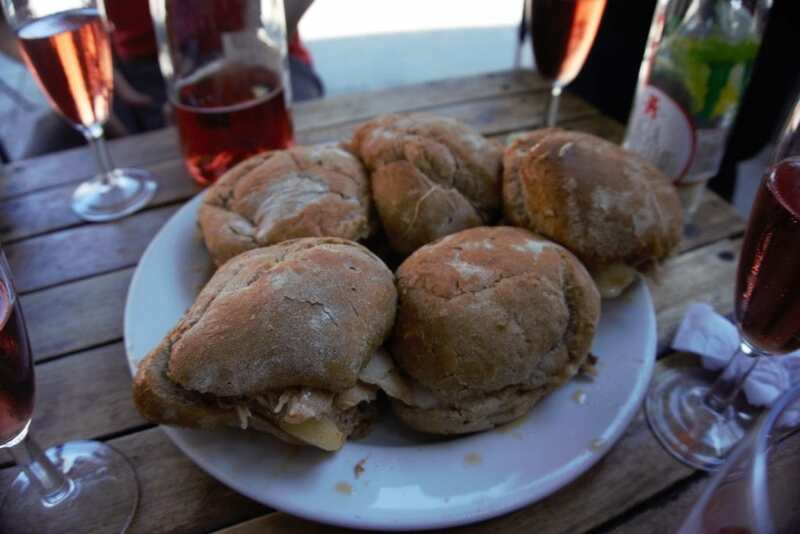 Our next stop was to get the famous pulled pork sandwiches with Serra da Estrela cheese from Casa Guedes. Depending on when you go, you may have to wait in a long line as the sandwiches are very popular. We only waited a few minutes. I am not used to having cheese on a pulled pork sandwich. The cheese has a strong flavor but it works. You just have to be careful because it can get messy! We paired the sandwiches with a nice rose wine and sat at the tables outside. The famous pulled pork sandwiches with cheese and some Rose. We chose to end the tour with something sweet. Portugal makes amazing pastries. GB brought us natas, the most famous pastry in Portugal, another dessert, and some coffee. It was a great way to end the tour. We were having so much fun, we sat for a bit and chatted. At this point, it was almost 4 pm, but GB still stayed and gave us some suggestions for other places to see in Porto. Ending the tour with some dessert, coffee, and nice conversation! Porto is known for its Francesinha sandwich. Francesinha means Little Frenchie in Portuguese. It is a sandwich with lots of meat covered with melted cheese and a hot thick tomato and beer sauce served with french fries. You are supposed to dip the french fries in the Francesinha sauce. It was the Portuguese way of making the croque-monsieur fit the Portuguese taste. Sometimes, they will serve the Francesinha sandwich with a fried egg on top. We did not get to try the Francesinha during our tour. We had planned to have it for dinner that night but we were actually too full. Next time I am in Porto, I must have one! I’m told Santiago f makes the best Francesinha in Porto. Unfortunately, the Finger Food tour is not suitable for vegetarians, but Porto Walkers also offer a Pastry Tour, Port Tour, Douro Valley Tour, and a Free Walking Tour. If you are looking for a fun night, they also have a pub crawl which starts at 11 pm and goes until the wee hours of the morning. I was tempted to join for the pub crawl but decided since I had a full day of driving ahead of me, I should probably take it easy. I enjoyed getting the local experience on our Porto tour, we had so much fun. Our guide, GB, was knowledgeable and very friendly. For €30 per person, I think you get your money’s worth with Porto Walkers. We had so much delicious Porto food and wine, plus saw the city and some local spots, and made new friends. 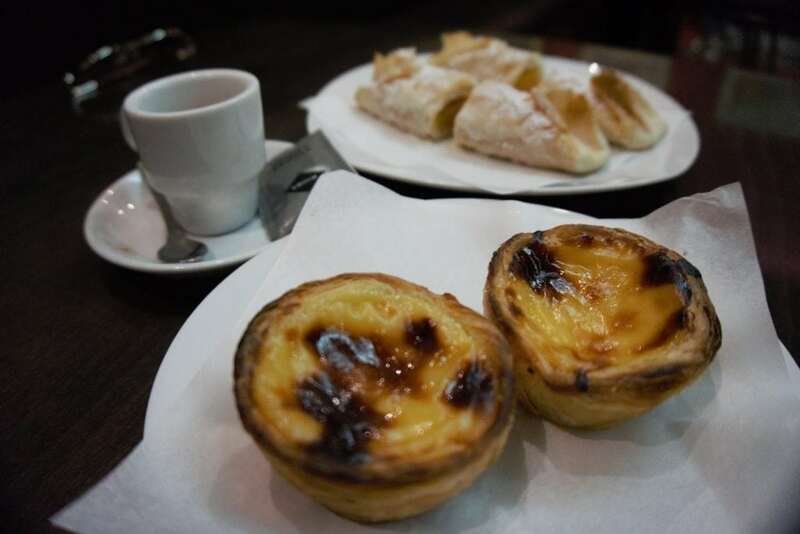 I loved everything that I tried on my Porto food tour, but I think my favorite thing was probably the nata. 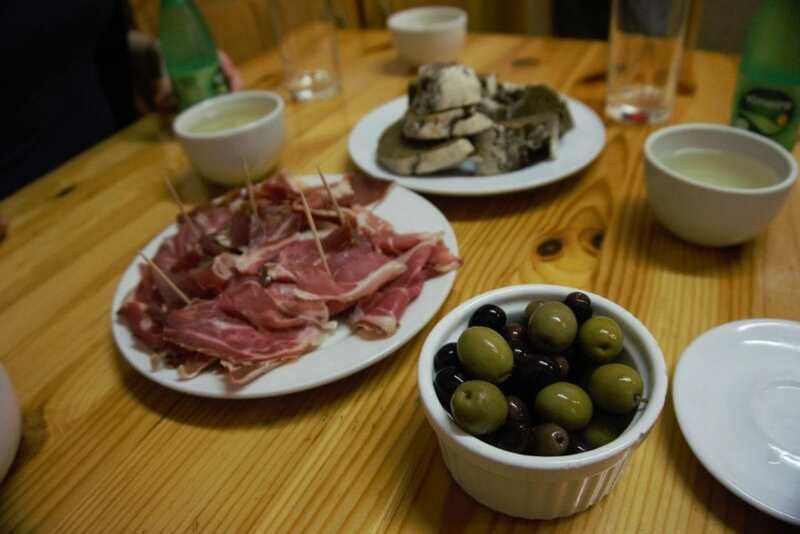 I hope to do more Portugal food tours on future trips. For more pictures, check out our video. Have you tried any Portuguese food specialties? What has been your favorite? Come hungry! You will get plenty of food. Pace yourself with the wine and make sure to also drink water. Make sure you reserve your spot with Porto Walkers in advance. 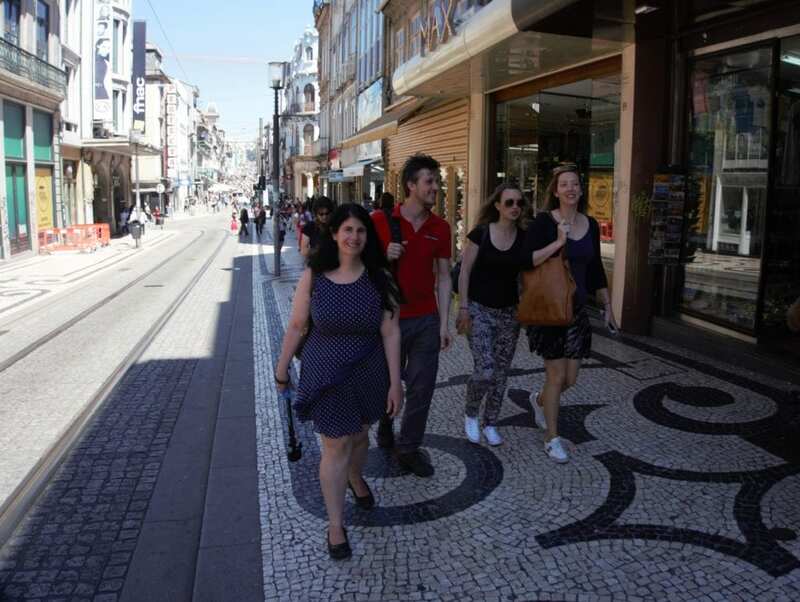 You can also check out one of their other offerings like the free walking tour in Porto. Disclosure: No financial compensation was received, but we were guests of Porto Walkers for the finger food walking tour. As always, opinions are my own. We are happy to co-host the Weekly Postcard Linkup. Everyone is invited to join us and share their travel blog posts here beginning at 12 p.m. (PST) / 8 p.m. (GMT) Friday, April 28th. If you would like a reminder email when the linkup opens, you can sign up to get one here. Lauren – Wow so glad to bring back good memories! I was addicted to the natas too! Yummy! I love taking food tours. Though honestly I guess I don’t know much about Portuguese cuisine. Those sandwiches all look incredible. Megan – Yes I didn’t know that much either so learned a lot on the tour. The food was delicious. 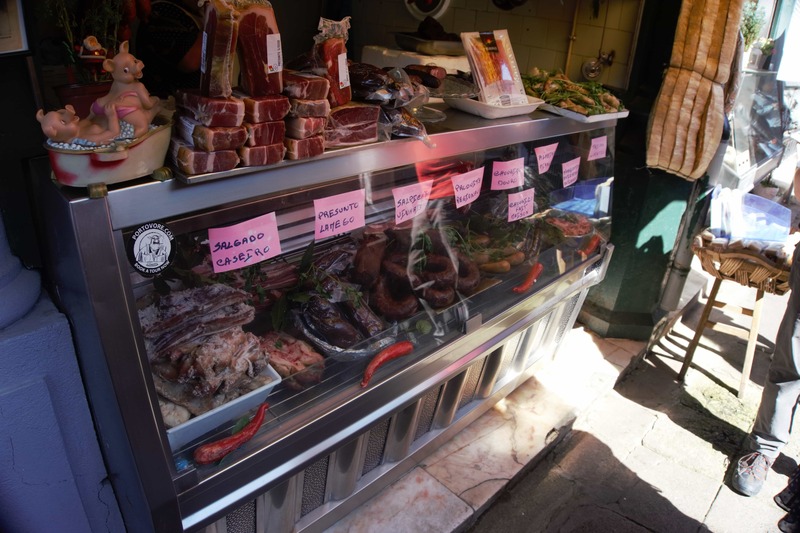 We almost always take food tours in cities we visit, so I thoroughly enjoyed your post. Those natas are so yum, we had several in Lisbon! Paroma – Thank you! Yes I love the natas too. Ooh I’m missing the food in Portugal. We ate a lot when we were in Lisbon and I’m definitely wanting to taste those pastel de nata again! I hope we could visit Porto when we go back Europe. I’ve read so many great recommendations about the city. Melai – Yes, Porto is a lovely city. I was only there for about 2 days and I really want to go back and see more. The food all looks great! Unfortunately I wouldn’t be able to do the tour though as you mentioned it wouldn’t be suitable for vegetarians 🙁 that’s a shame! Danielle – Yes most things we ate were either meat or fish based. They do offer a pastries tour which would be better for vegetarians. I heard a lot about food from Porto. Nice sum and details. Thanks Sapna. Glad you enjoyed the post. This all looks wonderful. I bet the pastries tour is to die for! Sherianne – Yes the pastry tour sounds so good! Might do that or Duoro Valley tour next time. Robert – Yes, food tours are so much fun. I hope you get the chance to visit Porto one day, it’s such a lovely city. This sounds like an awesome idea! Too bad it isn’t suitable for vegetarians since I don’t eat meat, but I love the concept. Megan – Thanks. Yes, sorry about that, maybe the pastry tour would be better for you. So much food! Your post made me super hungry. Thanks for all the information, and great highlight video! Thanks Kim. Yes it was a lot of food and so much fun. Thanks Steph! It really was a great tour, you would love it. I like that you are instructed to come hungry! I have never had a food tour before. Porto looks like the best destination to do this. The food pics got me so hungry already. Nice post! Bonnita – Thanks so much, we really enjoyed it. This looks awesome. Food tours are awesome. I have not been to Portugal but i would really love to take a food tour sometime. Thank you Anisa&Katherine! Bonita – You would love Portugal. There is so much to see so more coming up on the blog. Thanks so much guys! It really was a lot of fun, hope you guys get the chance to do it one day! Upeksha – The cod really was delicious! Lolo – Yes the food there is delicious. I hope you get to visit. Staci – Yes food tours are so fun! A San Diego one is a great idea. This sounds like a great experience. I wouldn’t have considered taking a guided tour, but this article shows that it can be worthwhile and have an added value. Sure did the trick for building up an appetite! Pascale – Yes, it was a lot of fun and having a local to guide us was great. I was able to ask any questions that I had. This is so timely! I’m visiting Porto in a few weeks! I will definitely check out this tour group. Jewels – That’s great! You will love Porto! If you’re a Harry Potter fan, also be sure to check out my last post. Haha yes and there is more coming on Porto as well. Corey – haha yes everything was so good and we had so much fun. You should try a food tour one of these trips. Thanks Luda. Brazil is a great place for a food tour, I loved the food when I was there. The food looks delicious! I think Portugal is a wonderful place for food. I loved the seafood I tried in Lisbon. Next time I want to visit Porto! Thanks Kat. Yes I loved the seafood and tried to eat as much of it as I could while I was traveling to Portugal. The food looks so delicious, but the pastry tour is pretty tempting! I love your tip about visiting a market. It is a great way to see a lot of the food options and buy a few things to sample! Stephanie – Yes I want to go on the pastry tour too! I’ve heard Portuguese food is not so great, but it seems you liked it a lot. I don’t eat pork or seafood, so I wonder if I could find any food to like in Portugal. They seem to be centered on these two foods can’t have. Anda – They do eat chicken there a lot too. I tried this chicken sausage that was really good. And of course, there is always the pastries! Anna – you would really enjoy the tour! Portugal is such a great country. Kat – Yeah we did not eat dinner that night either! You are going to love Porto. It’s a pity we missed each other in Porto, but looks like you had a great time there! I really fell for the simplicity of Portuguese food. Porto was definitely a good place to experience the food, did you try a francesinha while you were there? David – Yes too bad we just missed each other. It’s funny we had plans to eat the francesinha for dinner that night but we were just too full. Did you try it and what did you think?